On March 1st we, Jim Krumrei and myself, departed from Schiphol airport in the early morning hours. We arrived at the Joseph Adolf Pengel airport at about four o'clock in the afternoon. From there we took a taxi to the house of Wes and Titia Kroezenga. 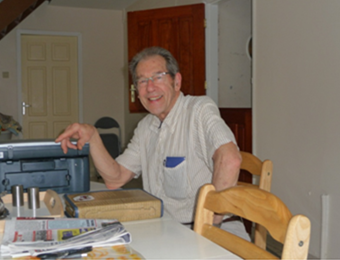 I have really enjoyed my time with Jim. Jim is a very good man that I appreciate a lot. I have enjoyed getting to know him even better during our travels and our time together in Suriname. I have really enjoyed the evangelism that we did together while in Suriname. Jim is 79 years of age but he is still very active and hard to be stopped. He is blessed with good health. As most of you know, Wes and Titia, moved to Suriname in May of last year. Wes and Titia are very dear friends of mine, they were converted back in 2008 from Pentecostalism. We worshipped together for about a year and a half in the city of Rotterdam in the Netherlands, up till the time they moved to Suriname. Titia is a native of Suriname and had always wanted to move back, and so they did in May of last year. Titia still owned a house in Suriname, when Wes and Titia moved back to Suriname they did not right away moved into their house, because work was needed to the house before they could move in. They rented a house nearby and lived in that house for about six months, last February they moved into their own house. Some work still needs to be done, however these things can be done as they are living in their house. I have really enjoyed my time with Wes and Titia, it was very good to see them again and to spend time together. We shared many good times, leisure time, study time, praying time and singing time. I was also able to help them out with some things in and around the house. 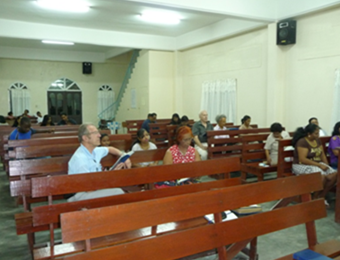 In the city of Paramaribo are two churches of Christ, one is English-speaking and one is Dutch speaking. The English-speaking church is mostly made up of people from British Guyana, a neighboring country, the Dutch speaking church is made up of natives Surinam’s. Wes and Titia had invited several members to their home at night, they had asked me to do a Bible study. I did a study on the story of Nicodemus and how rebirth consists of water and Spirit. We looked at the water and it’s relation to new Testament water-baptism for the remission of sin and we looked at several passages in the Bible from which we understand that life, new life, always comes through the work of the Holy Spirit. Dhanpersaud Ramkalewan, the preacher for the English-speaking church, had invited me to come and speak for them at night. I spoke on Esau, how we sold his birthright and how when he wanted it back he could not get it. The story of Esau started so rich but it ended in deep misery. Important lessons need to be learned by Christians from the story of Esau, in the book of Hebrews, a book that talks about Christians that had deeply fallen short in their lives, they needed to know that they needed to lift up their hands that were hanging down and that they were to straighten their feeble knees. As the writer of Hebrews admonish these Christians he reminds them of Esau how when he had sold his birthright he could not get it back in return. And so, sometimes the lives of Christians that start so beautiful and rich can end up in the misery if they sell their birthright. 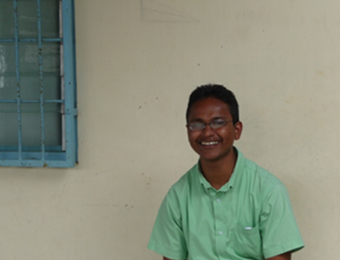 I really enjoyed getting to know Dhan. He is a wonderful man who loves the Lord, His church and His people. Dhan whose heart is burning to serve His Lord and Master. We shared many good conversations and we studied a number of things together. I really admired his zeal for the Lords work. Both these days I was with Wes and Titia for the greater part. We visited with one another, studied a number of things and had good times together. On Friday-night I went with Dhan to a study that he had with one of the families in the church, Dhan did a study on forgiveness. We had a wonderful time. We studied with a family of whom only the mother was a Christian, however her husband was also present and two of her children, that was a true blessing. On Sunday I spoke for the Dutch speaking group, I spoke on “seeing the unseen”, a sermon based on the story of Elisha in second Kings chapter 6. In this lesson we focused on faith and how faith is based on what we cannot see. We looked at the words of Jesus and how He often spoke the words that we need to have eyes that see and two have ears that hear. On these days several of us went out into the streets, knocked on doors and invited people for a Gospel meeting that was being held Thursday through Saturday. The people were very open to talk, we have many good talks with the people that we met. I was really amazed with how open everyone was to listen and to talk about God. On the first day of the meeting I spoke for the English-speaking groups on “the doctor who never lost a case”. There were several visitors from the community. On the second day of the meeting Jim spoke on “the Lord's supper”. Again, we had several visitors from the community. The third day of the meeting I was invited to speak, I spoke on “the power of an example”, I used the story of Timothy as an example of a godly young man who lived in a ungodly society. We talked about the need for role models, needed then and needed now. This day, I was invited by the English-speaking church to speak. In my Bible study I talked about judging and judgment, based on Jesus's words from the sermon on the Mount where he speaks about the danger of judging to quickly and His words is John seven where Jesus speaks about judging with righteous judgment. Many good questions were raised and many good thoughts were shared. In my sermon I spoke on “seeing the unseen”. Jim was with the Dutch speaking group that day. Since this was my last full day in Suriname we took an outing that day. Wes and Titia had arranged that we would go to “White beach”. A beautiful place on the Suriname River. We had a wonderful day together, shared many good spiritual conversations. This day was the day of my departure to go back to the Netherlands. 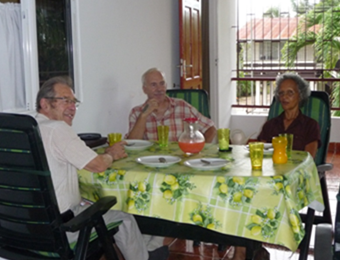 On the same day a good friend of Jim, Cor, would arrive in Suriname. Jim had arranged a taxi to take me to the airport and to pick up his friend. In the early morning hours of March 16 I arrived at Schiphol airport in the Netherlands. During the last couple of days, I received many wonderful presents from the Christians that I had been with. I have been really overwhelmed with their love and commitment. It was very special to be with them.